* It aims to promote teaching of basic computer science in schools and in developing countries. * The original model became far more popular than anticipated, selling outside its target market for uses such as robotics. * According to the Raspberry Pi Foundation, more than 5 million Raspberry Pis were sold by February 2015, making it the best-selling British computer. * In March 2018, sales reached 19 million. * On the CPU level, the first generation Raspberry Pi is similar to a 300 MHz Pentium II of 1997–99. While its graphical capabilities are roughly equivalent to the performance of the Xbox of 2001. I have only seen a Raspberry Pi in photos before so I was quite in awe of its size when I finally opened the box. 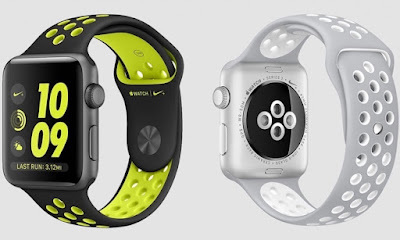 It measures just 85.60mm by 56.5mm or around 3 by 2 inches. As I said, I got the Raspberry Pi 3 Model B+ rather cheap since it is bundled with a case, power cord, 32GB micro SD card + adapter, HDMI cable, heatsink, USB cable, and 3.5 inch touchscreen display. It is loaded with a 1.4 GHz 64-bit quad-core ARM Cortex-A53 processor, 1 GB RAM, gigabit Ethernet, on-board dual-band Wi-Fi, Bluetooth 4.2, Power over Ethernet (PoE) feature, and USB and network boot capabilities. The first thing that I did after unboxing the package was placed the Raspberry Pi inside the included plastic case. The plastic case needs to be assembled and it didn’t come with instructions so I had to figure it out myself. Next, I searched on Google on how to install an OS into my Raspberry Pi. So, I downloaded Raspbian, a Debian-based OS highly optimized for the Raspberry Pi and installed it. 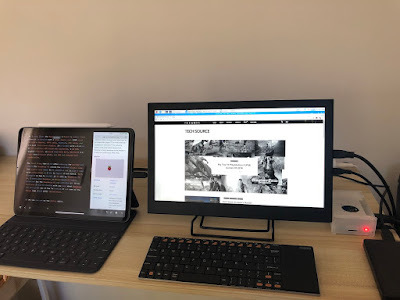 On my next post I will be sharing with you more about Raspbian and will guide you on how to install it and give you tips on some of the things that I did after installation. As you can see from the photos above, I now have a full-pledged desktop powered by a tiny computer. 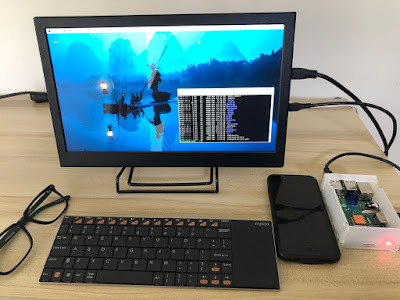 I connected my Raspberry Pi to my 13-inch HD display and it runs smoothly without lag or graphics issues. I also connected a wireless mini keyboard with built-in touchpad and an external hard drive to complete the setup. As of now, I am using my Raspberry Pi as file and VNC server (set up my iPad Pro as VNC viewer). I also intend to use it for testing Linux distros and for doing a bit of Python programming. As I’ve said, my next post will be all about installing and setting up Raspbian on Raspberry Pi so watch out. Last year, Apple introduced the highly anticipated “dark mode” feature on their macOS (Mojave) desktop operating system. Many Apple fans regarded it as a cool and useful enhancement to their desktop user interface. 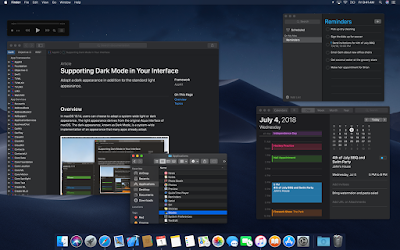 It allowed users to turn on the system-wide dark color scheme and encouraged third-party app developers to offer a dark mode for their Mac apps. If you are thinking that Apple is the first to use this feature on the desktop, think again. As far as I can remember, Linux is the first desktop OS that lets users easily customize the UI and provided plenty of dark theme options. I think Ubuntu started the trend in using darker themes out of the box several years ago, and they did it in a more elegant way when compared to other Linux distros. Elegant in a way that the dark scheme UI was consistently used and built-in apps were using dark themes. 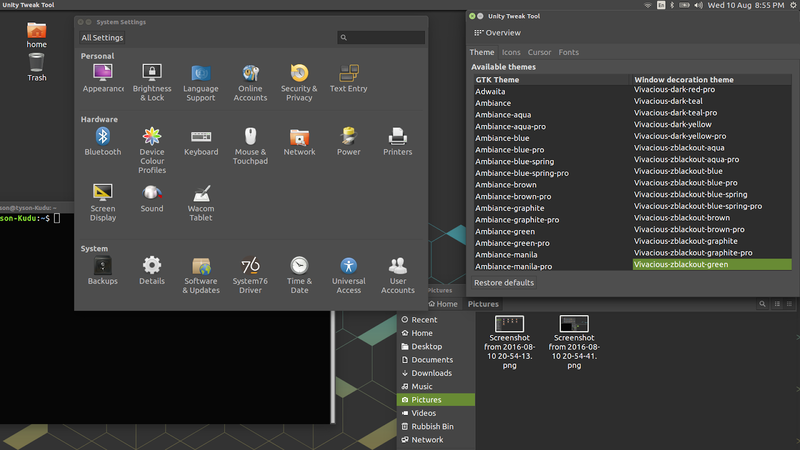 When customizing my Linux desktop, I always prefer dark themes since it is easy on the eyes and it looks good. Dark background also allowed me to focus more on the job at hand because there is less visual distraction. Using dark mode on my Mac desktop right now, I can’t help but think about the endless customizations I did before on my favorite Linux distros to achieve that perfect dark look. So to all the Mac users out there who also enjoyed using the dark mode on their desktop, perhaps you can thank Linux for showing the guys at Cupertino that dark mode UI is not just cool but also usable. However, correct me if I’m wrong through the comments below if you think that Linux did not have any influence whatsoever in this new macOS feature. So let’s get started. I made here a list of my favorite PS4 games last year. Do please note that my choices of games are mostly action, simulation, survival, sci-fi, fantasy, first-person shooter (FPS) shooter, and role playing games (RPG). These games only made it through the top ten list because of their cool realistic graphics, amazing storyline, and of course their highly engaging gameplay. 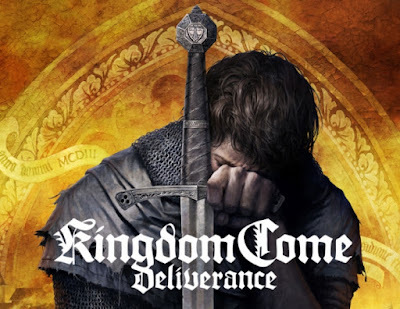 Made by Warhorse Studios, Kingdom Come: Deliverance is a single player, open world action role playing game set in the Medieval Kingdom of Bohemia in 1403. Although this game barely made it to the top ten, it is an awesome game with a fantastic storyline. This game takes place during a war in Bohemia where you will be playing as Henry, a common blacksmith’s son who lived a very normal life until the Cuman mercenaries (the game’s main enemy) attacked and destroyed his village and killed (almost) everyone he knows and loves. Luckily, Henry escapes and soon joins Sir Radzig Koblya who leads a resistance movement against the Cumans. 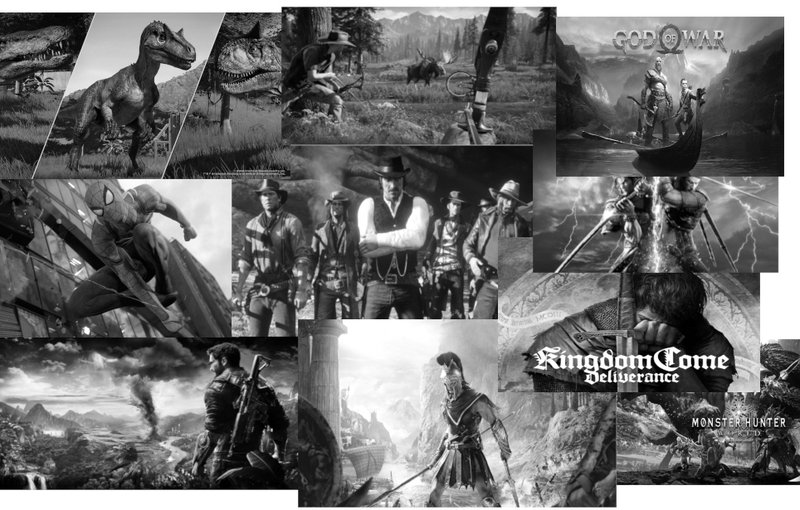 The Game has a pretty long main storyline with lots of side quests and amazing characters for you to discover. Its combat mechanics are a little bit hard to master and its realism is a bit high because the armor can offer a lot of protection. The swords and gear can break and get dirty and with the armor offering heavyweight protection, you really need to search for weak spots in order to defeat your enemy. It also gets very frustrating when your shiny plate armor gets bloody and dirty after a long journey or a fight because you have to clean it frequently. But still the gameplay is enjoyable and and above all, it does not need Internet connection to be played. This is a Business Simulation game created by Frontier that lets you create your own Jurassic Park. It is a very nice simulation game that takes place on the six islands based on the movie Jurassic Park. It is a fun game because you can observe your dinosaurs roam around your park. You also get to take care of your dinosaurs by feeding them and giving them a perfect home with lots of buddies, and another exciting feature is, you can create your very own dinosaur arena and watch your dinos fight or might I say rip each other to pieces. 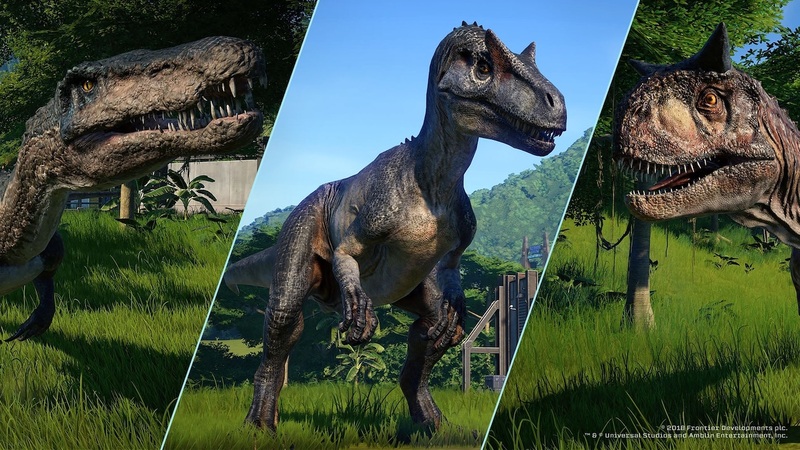 The game also features main missions, side missions, and of course your very own sandbox, so that you can create the perfect park with unlimited cash and without your dinos attempting to break out. The only thing that is quite disappointing about this game is the short dino lifespan, but of course in the sandbox mode you can let your dinos live forever perhaps even longer than you. Thus, overall this game is very entertaining especially to those who are a fan of dinosaurs, But Dino fan or not, this game is definitely worth a try and it does not need Internet connection to be played. 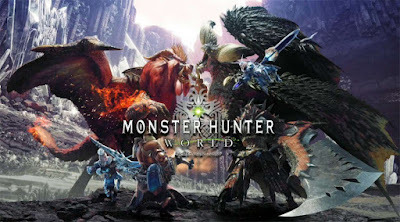 Developer by Capcom, this game is the newest installment in the Monster Hunter series. In this game you can create your own custom character and you are tasked to track down, kill, or capture any monster you see. The plot of the main story of the game is that you are one of the hunters of the new world. You are sent to hunt and capture monsters for your colony. Although some of the old monsters are returning to the game, there are a lot of new monsters, some even bigger and scarier than the old ones. The game also features a lot of new weapons for your hunter such as swords, spears, bows, and even guns, along with a lot of very customizable armor pieces so that you can kill monsters in style. Overall, the gameplay is surprisingly fun and worth your dime. You can play this alone or with friends for more fun and they’ll definitely be amused. This game does not need Internet connection to be played. 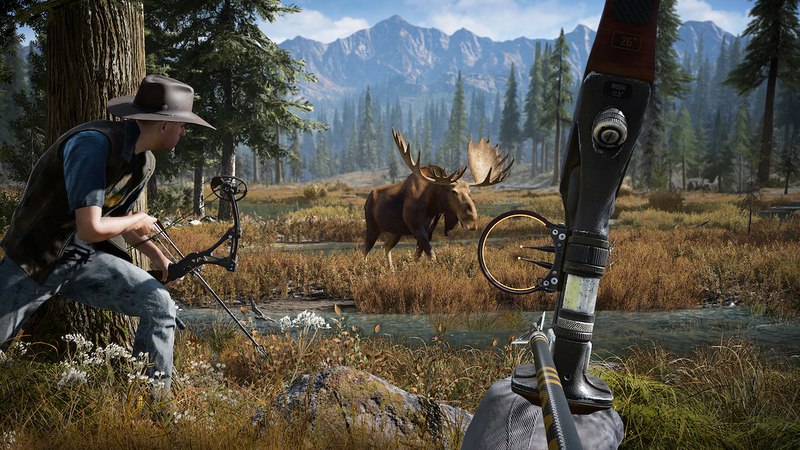 Created by Ubisoft, Far Cry 5 is an open world FPS game that sets place in Hope County. The main story lets you start as a deputy trying to stop a cult from taking over hope county. After a failed attempt, you are saved by freedom fighters and you join them in the fight against the cult. In Far Cry 5 you can create your own character and equip him or her with various weapons, vehicles, and customizations, and you can also bring in guns for hire in the fight against the cult. This game also features a map creator so you can create your own levels and even play with your friends. You can play Far Cry 5 in singleplayer or multiplayer mode and it does not need Internet connection to start. This game is really entertaining and gut-busting, but I think that the main story goes a bit too fast. 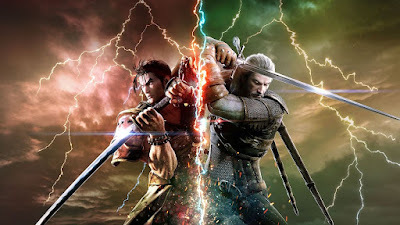 And although this game is single player and does not need Internet connection to play, but you can connect online and look for challenges or online players to make the game even more exciting. God of War is an action adventure game that is developed by Santa Monica Studios. 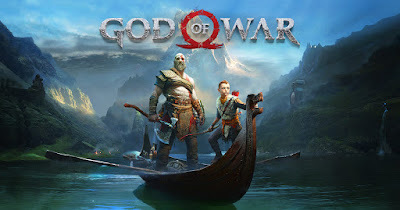 The latest game is the eighth installment of the God of War series, and it continues the story of Kratos years after he killed his father Zeus and destroyed all of the Greek World. In God of War you play as Kratos who is now in Norse Mythology, and his son Atreus. In the main story Kratos and Atreus will journey throughout the nine realms to fulfill their promise to Kratos’ second wife and Atreus’ mother to spread her ashes in the highest peak in the nine realms. The latest God of War has a fantastic and highly moving storyline. Most of the characters are fun to interact with, and the game features lots of enemies, jaw-dropping boss fights, and a variety of enjoyable characters. The graphics of this game is really cool and realistic, and the monsters look awesome, so it is definitely worth checking out. God of War is a single-player game and does not need Internet connection to play. Soulcaliber VI is a Fighting Game Produced by Bandai Namco Entertainment. In this game you can play with more than 20 existing characters to choose from or you can create your own custom characters. It also features a lot of cool weapons for your custom character and a lot of other customization options. Soulcaliber VI is a very fun fighting game that features 2 campaign modes, soul story (the original story mode), and Libra of Souls (the story of your own custom character). The game’s fighting is very detailed and is highly realistic because your armor can break, you can roll if you are knocked down, and you can push your enemy off a cliff for an instant kill. The character’s fighting style is also diverse because each weapon has its own moves, special skills, and fighting style. Overall, the game’s graphics is superb. Though there were times the capes clip with the armor, and the story mode isn’t the best out there, but it’s the fighting strategies that really made Soulcaliber VI an awesome game and worth it. 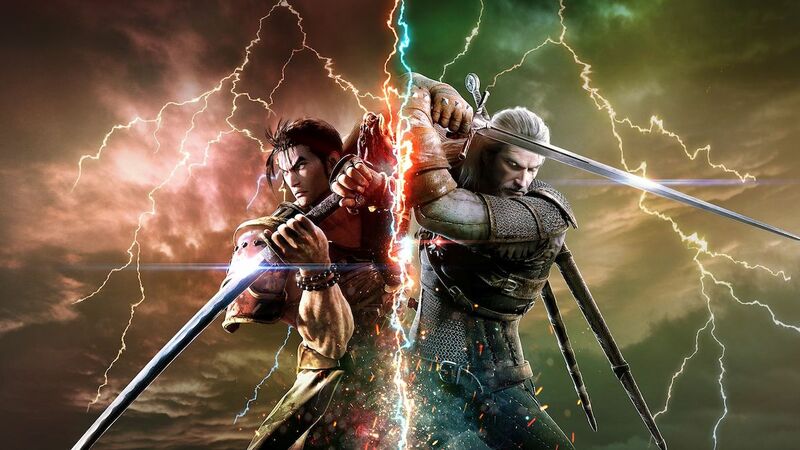 Although this game is single player and does not need Internet connection to start, you can still play this on split screen in online multiplayer mode. 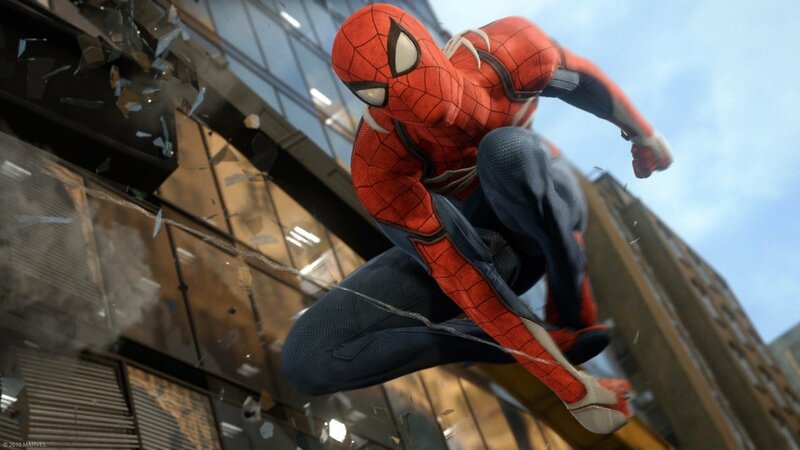 Created by Insomniac Games, Spider-Man is an awesome game based on the super hero Spider-Man. In this game you play as Peter Parker, or should I say Spider Man who spends his time swinging all over New York stopping crime wherever he goes. This game features most of Spider-Man’s enemies such as Kingpin, Shocker, Doctor Octopus and more. It also lets you craft a whole lot of cool gadgets and high tech suits to help you bring those bad guys down. It even has these cool skins — the Avengers Infinity War Iron Spider suit, Spider-Man Homecoming suit, and the Homecoming Stark suit. In this game you will not only take down common street criminals but super powered minions as well. These super powered minions can either have dark demonic powers, high tech jet packs, rock hard skin, and more making the game very enjoyable than ever. You will also face many challenges, find cool collectables, and even visit the Avengers Tower. The game also has one of the best main stories, you will want to keep playing until the very end because it gets more exciting and you will even meet a lot of interesting characters along the way. The game also has side missions, challenges, and a whole lot of landmarks. Overall, Spider-Man is an awesome game and is definitely worth it. The game is single player and does not need Internet connection. This game is an open world action RPG game created by Ubisoft and is probably one of the best in the list. 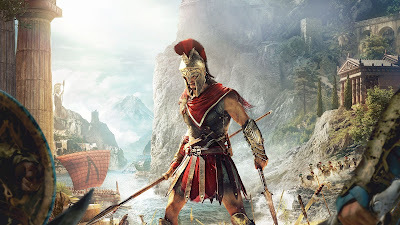 In this game you play as either Alexios or Kassandra and the story takes place in Greece during the Peloponnesian War, a war between Sparta and Athens. In the game, no matter what character you choose you start off as a common mercenary that wields the blade of Leonidas (who is your grandfather) the former king of Sparta and has a pet eagle named Icarus who looks out for enemies and helps you hunt for materials. Your main weapon is the blade of Leonidas that serves as your hidden weapon in the game (sadly there are no other hidden blades in this release compared to the previous) and gives you incredible powers such as bull rush, hero strike, and the good old Sparta kick. In Assassin’s Creed Odyssey you are on the hunt for the people who destroyed your family, which is the cult of Kosmos (the main enemy) while at the same time trying to bring your family together again. The game has a nice main story and has a lot of interesting side quests all over Greece. It also offers your character a lot of weapons such as axe, swords, daggers, hammers, bows (but sadly no shield), and a lot of armor for your characters protection and style. It even has a few mounts to buy and unlock. In this game you also have your own boat where you can customize your crew members and add special lieutenants to improve ship power. Overall, the game is magnificent and is worth every penny. Just Cause 4 is an open world action game created by Avalanche Studios and Square Enix. In my opinion, this game is probably one of the best games of 2018. 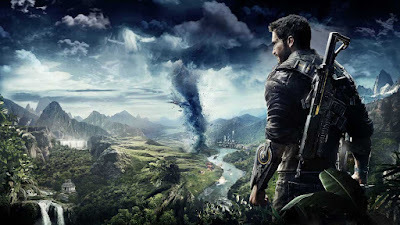 In it you play as the badass former secret agent, Rico Rodriguez who (after killing Di Ravello and avenging his family) went to the fictional South American country known as Solis to search for his father’s secrets, only to find that his father left a weather machine capable of unlimited destruction. This game, like all other Just Cause games, features a lot of guns, vehicles, and a lot of destruction. It also offers a whole lot of tech, explosion, and awesomeness. Like for example you can have a gun that shoots drones and lasers or a boat that can make the enemy base rain with lighting. Just Cause 4 also lets you create an army of chaos that you can use to help yourself in the fight against the Black Hand, which are the game’s main enemies. Overall, the game has fantastic graphics, storyline and is highly engaging. Red Dead Redemption 2 is my top favorite game of 2018 and it may be the best game I played since 2016. It was developed by Rockstar Studios and for me it is just perfect, a flawed masterpiece. I could play this game for a month and could not still get enough of it. 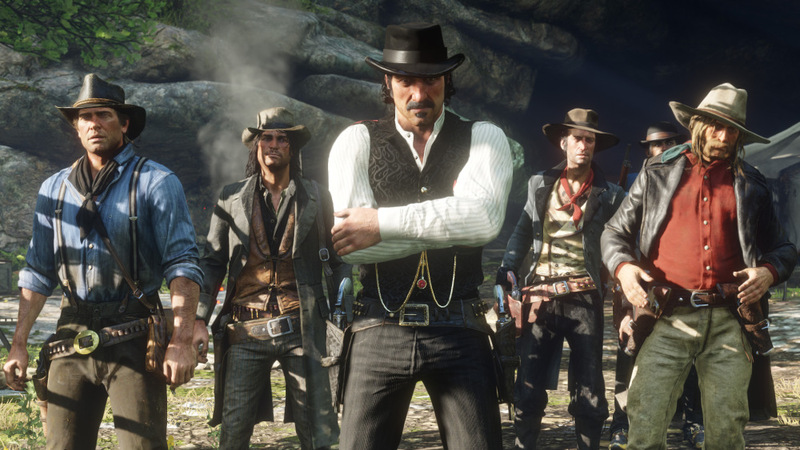 In Red Dead Redemption 2 you play as Arthur Morgan, an outlaw in 1899 America who just escaped a place called Blackwater with his fellow gang members after a failed heist, and has a mission to make his gang rich again (after losing all their money in Blackwater) and to ensure that he and his gang survives with the law chasing them. In terms of graphics, this game is just amazing and the realism is excellent that guns look like the real thing. The game also has some realistic survival elements because your character can get sick, hungry, tired, dirty, and even your hair can grow in this game which is so cool. You can also hunt 100 plus animals in the game for food. The NPCs of this game also feels so alive and breathing you almost don’t want to kill them. In addition, the environment details of the game are very realistic like the snow, the dirt, even the water. In Red Dead Redemption 2, horse riding is probably the best means of transportation and the horses are very detailed that their sizes, speed, and faces differ. The horses are your most valuable companions and they can even kill some enemies if you are lucky. This game also offers your character a lot of outfits and guns to use, and you can even go bounty hunting or go rob a train if your money is low. In the game, you also have a special ability called deadeye that allows you to slow down the time and then you shoot the life out of multiple enemies like a pro. Overall, Red Dead Redemption 2 is so close to perfection that it is my top pick for 2018. You just have to get your hands on it and for sure you’ll be hooked. Please note that even if the game is single player and does not require Internet connection to play, there is always an online mode if you want to play with friends. Written by: Marco Auza. Note: This is Marco's first article for TechSource. He will be writing game reviews during his free time since he is still in Junior High School. * I finally got burned out of thinking about topics to write, writing, proofreading, editing, and posting. * The other reason is that I got into iOS app development that took most of my free time. I lost focus, and so I started my disappearing act from the World Wide Web. Some of you may wonder why I came back after all these years. Well, I just missed writing. I’m now more excited than ever to share with you again all the tech-related stuff that I find interesting. Although I am still quite busy with mobile app development and physical (offline) business, I have more hunger and freedom now to write so I think this is going to be fun. So where do we go from here? Before I decided to make a comeback, I’ve been thinking about ways to revive the site. Like, should I change the design of the site first? -Which I did. As some of you may notice, the site now has a new design. It is now more mobile friendly than ever and more responsive. I hope you all like it, and please bear with me if you encounter some problems as we are still making a few adjustments and site enhancements. I have also been thinking about changing the main topic or the future content of the site. Since the beginning, I have been posting mostly about Linux and other open-source software. When I took a break and have been developing apps for iOS, I obviously have been relying on my Mac as my main computer and OS X operating system. So I have to be honest with you that I have not been using Linux for a long time now and have lost track on what’s happening in the world of free and open-source software. Some of you Linux fans out there might be disappointed but I hope you’ll understand. As some of you may know, I also love Apple products simply because of their excellent hardware design and software reliability. In fact, I posted here before that I run Linux on my Macbook Pro. Moving forward, I’m still going to post tech-related stuff but I will not just focus on a particular niche. That way, I will have more freedom to share with you what I know or experienced. I just hope that the things that I will be writing about will somehow be useful to you because that has always been the main reason why I started this site. For those of you who stick around and for those who are planning to follow this site no matter what, thank you and see you soon! Edit: My apologies for those of you who commented using mobile devices the past few days. Comments were not published due to error. I have already fixed the issue and comments will now push through. 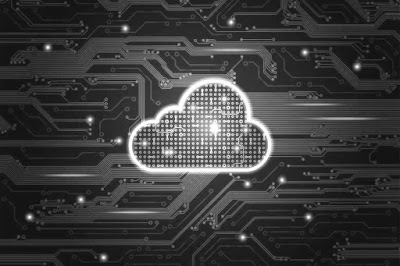 As far as cloud-based applications go, the market seems to be very competitive. With the recent OneDrive controversy, users are becoming much more conscious about how and where they invest their valuable data. Pricing changes or changes in business models have started to backfire against companies pretty quickly. In other words, cloud-based applications are no longer second-class citizens on the desktop. 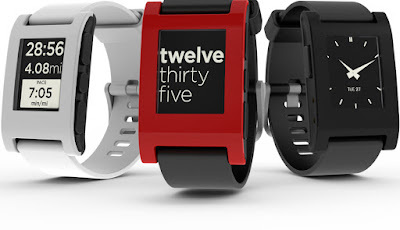 In fact, they have become a solid business model that big companies like Google, Microsoft, and Apple heavily rely on. 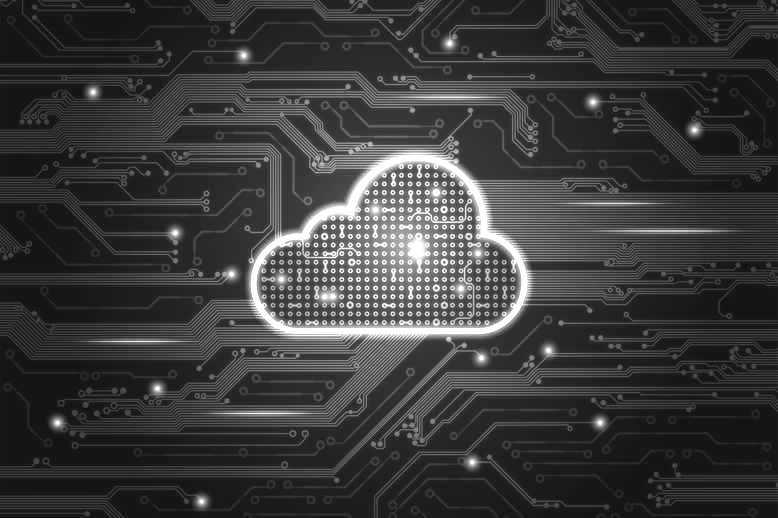 Now that the cloud has become an end-user commodity rather than a product that was meant for data giants, companies are trying hard to increase the outreach of their cloud services to clients across all platforms. One such attempt is to bring more Linux users to the party by treating Linux-based desktops at the same level as their Windows and Mac counterparts. Many cloud-focused companies have already made available well-supported Linux clients for their services. This, in turn, has made Linux as a lucrative platform for people who dual boot or switch their computers a lot. That way, they can enjoy all their important files on Windows at work and Linux at home. It's a win-win situation for both parties. Today, we will be focusing on a few such cloud-based applications that work natively on Linux without any major glitches or bugs. While we waxed eloquent about the cloud-based applications available on Linux right now, we would be more than glad to leave out Google's name in this case. The search giant has already angered a lot of Linux users lately over their lack of support for the penguinian desktop. While the Google Drive client seems to be well-supported on Windows, Mac, and Android, the Linux desktop has largely been ignored for more than a year. Thankfully, some great alternatives have emerged to make sure that Linux users don't miss out on the amazing service. Insync is one such alternative. The application comes with a host of features that even the official Google Drive client doesn't offer. Features like command-line usage, Raspberry Pi usage, feed of file changes, and multiple accounts are present in this application. However, unlike Google's client, it's not free. The developers charge about a one-time $20 fee for downloading and installing the application. If you are someone who relies heavily on Google Drive and your Linux desktop, this is worth paying for. Copy is an often-forgotten application in the small list of cloud-based services on this platform. What separates this app from its competitors is its focus on providing a cross-platform syncing solution with a focus on security and privacy. While it is not as secure as SpiderOak, it does, however, make security a priority. Another great thing about Copy is that it is generous when it comes to providing storage space. While Dropbox offers a meager 5 GB for starters, Copy gives you 15 GBs of storage space to begin with. Overall, it is a great backup solution if you're looking for something new and fresh. Dropbox is the tried and tested solution for Linux users that has worked well in the past and continues to work well even now. It offers a stable and powerful interface that is at par with its clients on Windows and Mac. Furthermore, the support and the steady stream of updates the Linux client gets makes it a great default cloud solution for many users. Whether you are a new Linux user or a penguinian ninja, you'll have no trouble getting used to Dropbox. These days, securing the data you store on cloud has become a number one priority for many uses. Furthermore, there is one more area where companies are a bit nebulous in their offerings towards their customers, and that is privacy. SpiderkOak is a company that plans to change that. Their service has a strong focus on keeping your data safe and secure and making sure that no one other than you can access it. By providing adequate security measures, SpiderOak is designed in such ways that not even the company's employees are allowed to access your data. The best thing about SpiderOak is that it works perfectly on Linux and can even be accessed via command line (for those terminal junkies out there). Hollywood, with all its glitz and glamour, seems like the last place you'll find the mighty penguin's influence. Well thankfully for all Linux fans, the truth is quite the opposite. The open source operating system has played a key role in turning many directorial dreams into silver screen successes. What attracts the billion-dollar industry to this 'free as in free beer' operating system is not its price. In fact, it is Linux's unmatched performance is what makes it the preferred choice over some of the top-of-the-line operating systems like Windows and Mac OS X. Be it screenwriting, animation, editing, or post production, Linux can be used in pretty much every department involved in the making of a major motion picture. If you're wondering where exactly the mighty penguin has impacted Los Angeles, sit tight as we list some of the most prominent examples of Linuxian influence in Hollywood movies. Scooby-Doo was a popular 2002 flick by Warner Brothers starring Sarah Michelle Gellar and Freddie Prinze Jr. Adapted from the popular cartoon series, this was the first live action movie in the franchise. Since the success of the movie relied on portraying an animated dog, and not just any dog, but the mighty Scooby Doo himself, the pressures were high. And this, my friends, is the scene wherein Linux steps in to save the day. Animators of the post-production studio Rhythm & Hues used about a hundred Linux desktops to make the popular Hannah-Barbara look as realistic as possible. Using Film Gimp (now Cinepaint http://www.cinepaint.org/ ) and other proprietary Linux-based tools, the open-source desktop was a key contributor to the movie's success. No wonder, Scooby-Doo was the 15th most successful film of 2012 with an official box-office gross of more than $275 millions. Spirit: Stallion of the Cimarron is a 2002 Oscar-nominated movie that has grossed over $122 million so far. On June 3rd 2002, in a press release, HP announced that Linux played a critical role in the production of the movie. It was also the first movie to place Linux in the hands of animators giving them power to create a unique blend of 2D and 3D animation. Furthermore, it also helped power Dreamworks' proprietary 2D animation software Toonshooter thanks to HP's high-power Linux workstations. multi-year alliance is indicative of this movement." Shrek the Third is another great movie where Linux was involved in the making. Released in 2007, the third installment of the popular animated movie franchise grossed over 322 million dollars at the box office. DreamWorks with their powerhouse animation backend of more than 1,000 desktops and more than 3,000 server CPUs relied heavily on Linux for bringing the movie to fruition. What was more important was that Shrek pushed the limits of where animation can go with the accurate detailing of the models' hair and flow dresses. Furthermore, the movie also included lighting and effects that were rarely found in movies at that time. You can read more about the involvement of Linux in the movie on a Linux Journal article. Probably one of the biggest movies ever made, Titanic ranks amongst the movies with the best special effects. According to Box Office mojo, the current worldwide gross of the Oscar-winning masterpiece stands at a whopping $2,186,772,302. And yes, here too, Linux had a big part to play in the making of the film. 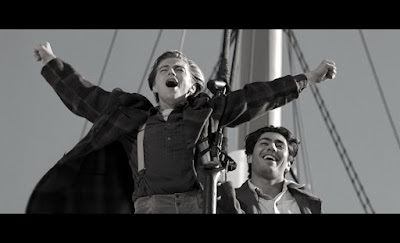 Titanic, as you may know, relied heavily on the use of visual effects. A risky move at that time considering they had to create a complete ship from the ground up and everything from the water to the flag on the ship was to be pure CGI. Despite having a lot of choices in the operating systems department, no other OS proved as powerful as Linux to give birth to one of the biggest cinematic experiences of the decade. "The Linux systems worked incredibly well for our problems. The cost benefit was overwhelmingly positive even including the engineering resources we devoted to the problems. The Alpha Linux turned out to be slightly more difficult than first expected, but the state of Alpha Linux is improving very rapidly and should be substantially better now. Digital Domain will continue to improve and expand the tools we have available on these systems. We are engendering the development of more commercial and in-house applications available on Linux. We are requesting that vendors port their applications and libraries. At this time, the Linux systems are only used for batch processing, but we expect our compositing software to be used interactively by our digital artists. This software does not require dedicated acceleration hardware, and the speed provided by the Alpha processor is a great benefit to productivity." Time and again, Linux has played a huge role in successes of many Hollywood blockbusters and continues to do so till this day. It is not just the low cost that has made Linux such an attractive choice for high-profile media studios, it is also the unmatched performance it offers that easily outshines what Apple or Microsoft offers. 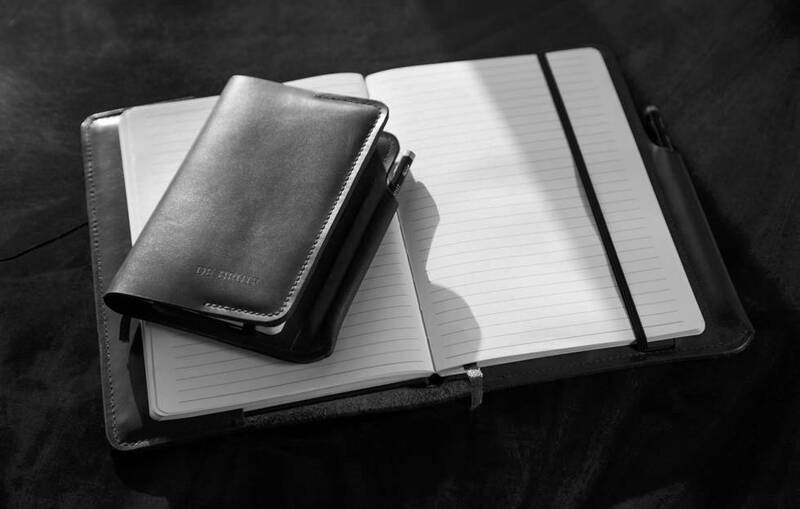 When it comes to taking notes on the go, there are many solutions you can try out. You can carry a small notepad, you could take notes in a simple text file, or you could try out any app from the thousands of choices the Android Play Store offers. While there seems to be no dearth of good choices in this department, apps that are truly cross-platform are hard to find. That's why, in today's article, we'll help you find apps that you can use to take notes and refer to them from everywhere. 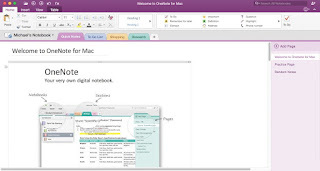 OneNote is Microsoft's heavily publicized note-taking application. It is a simple, easy-to-use service that ties in perfectly with MS Office Suite of desktop tools. 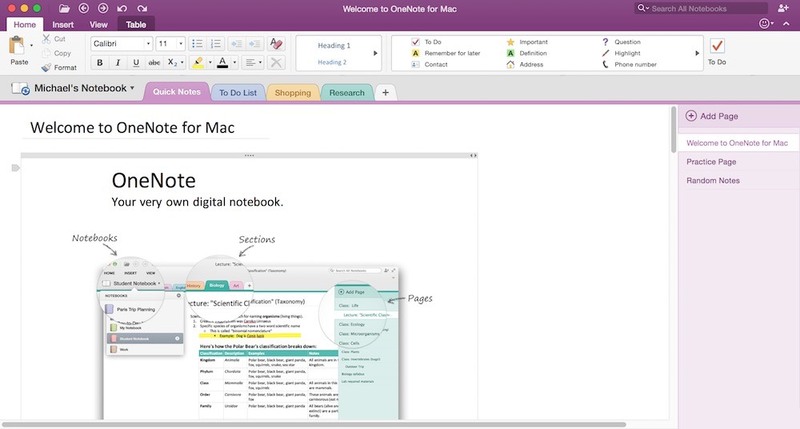 Compared to Evernote, OneNote stacks up quite well with its easy-to-use interface and cross-platform capabilities. 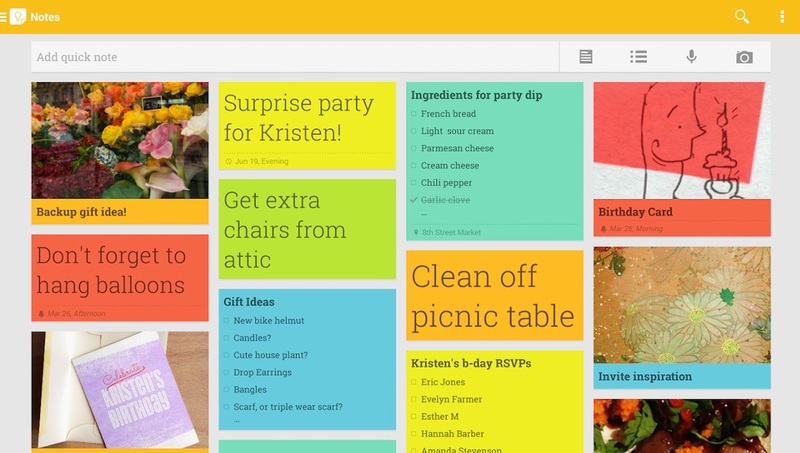 You can take and access your notes on desktop, web, mobile, and tablets. The interface conforms to Microsoft's popular ribbon UI and anyone who has used MS Word or MS Excel (2013+) would have no trouble getting started with it. The best thing of all is that OneNote is entirely free to use with no premium tiers or restrictions. Much like Evernote, there isn't a Linux version for OneNote. However, having tried the web version myself for about a few months now, Linux users won't be missing out on much. 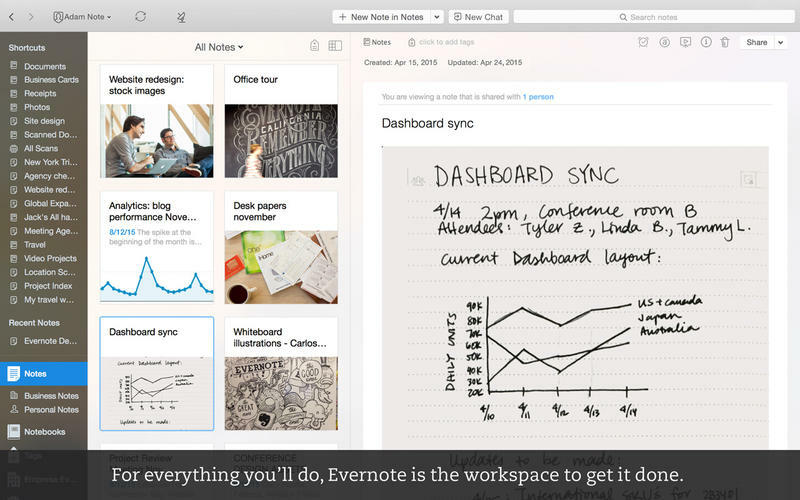 Evernote is a frontrunner in the race for being one of the best cross-platform note-taking applications out there. It is stable, works across all major platforms, and has excellent features that are useful for users from all backgrounds. What's great about this application is that it seamlessly syncs all your data across all platforms. Be it bills, receipts, or even a complete novel, you can store pretty much everything in your Evernote account without having to worry about data loss. While there isn't a Linux version for this service yet, there are a couple of third-party applications you can try that will let you access your notes on Ubuntu and other distributions. 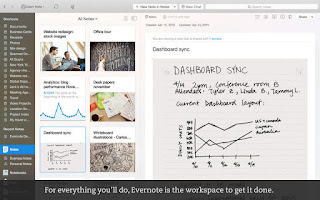 Once such application is Nevernote, an open-source clone of Evernote ( http://nevernote.sourceforge.net/). 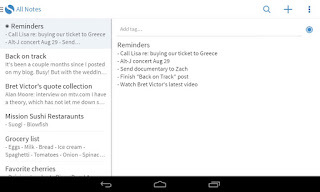 The app provides a basic interface for accessing your notes and creating new ones. Other than that, you won't find any bells and whistles you usually find on the Windows or Mac application. The basic version is free to install and use and is enough for anyone who's looking for a solid cross-platform note taking solution. Simplenote has been around for quite a while now. However, it never really got the attention it deserved. 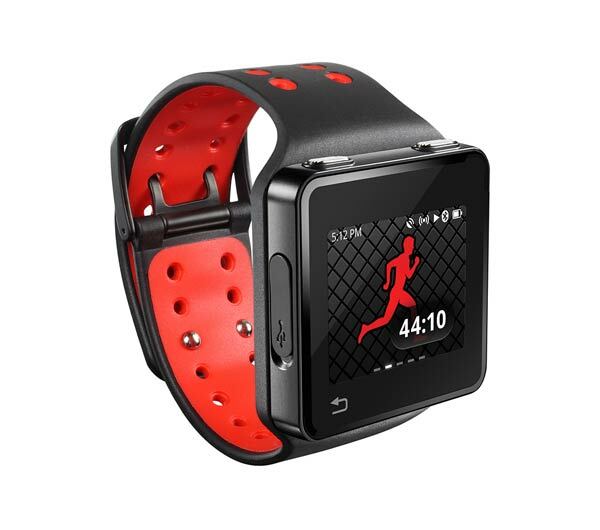 Its lightweight, clean interface is something that makes it stand apart from other feature-heavy applications and services. The application has a web-based interface and has apps that work perfectly well on iOS and Android. Simplenote, by living up to its name, ensures that you get the bare minimum features you need from a cross-platform note editor. 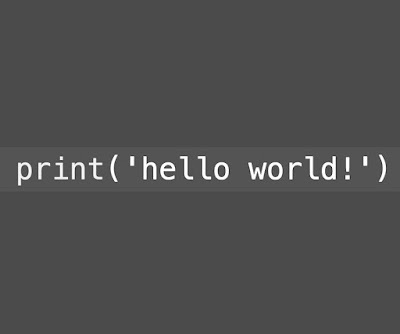 That said, as simple as it is, the service supports Markdown thus letting you publish your notes on the web and share them with your friends and coworkers. 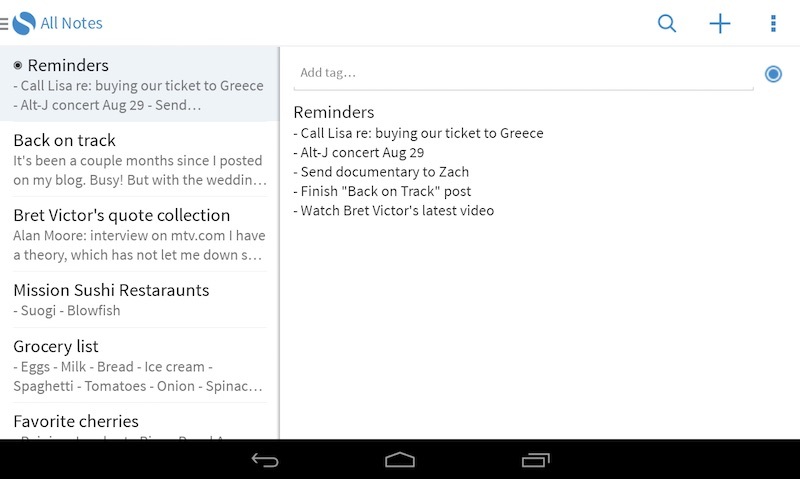 Overall, Simplenote stands apart not only as a great note-taking tool but also an effective productivity app. 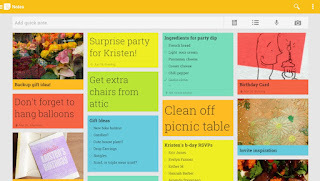 Google Keep is the search giant's way of letting you know that it has its tentacles spread across all areas of your life. Just kidding. If you're an avid note-taker and are looking for something that ties in well with the Google ecosystem, this is an app you must try. It's simple, colorful, and does the job pretty well. You can group your notes in categories and tag them with different colors. Furthermore, it also allows you to show notes based on your location, thus letting you remember anything you have to buy whilst going out shopping. 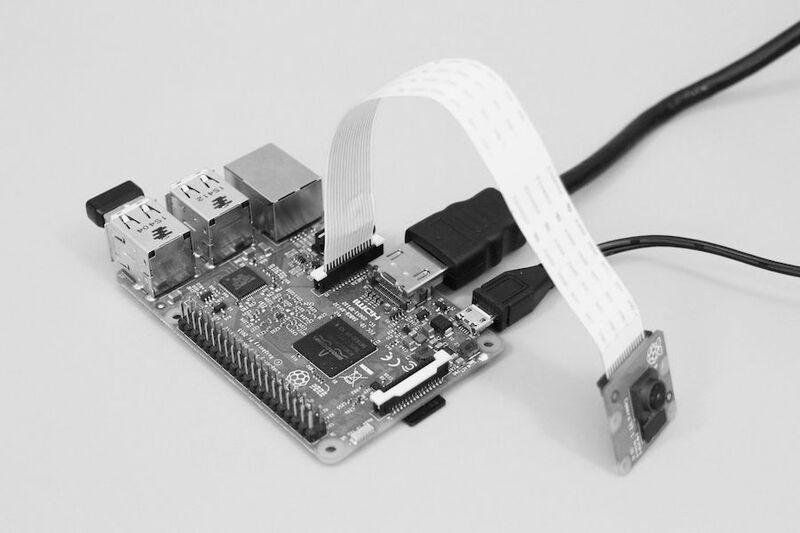 Raspberry Pi, when first launched about two years ago, became an instant phenomenon. After all, who could have thought of a $35 computer that lets you browse the web and does most of your office work? What is even more surprising is the reception it got from average users. Usually, one would expect a bare-minimum $35 board computer that runs Linux to be popular only among developers or geeks. However, as many as 100,000 Raspberry Pi units were sold on the day of its launch eventually selling more than 2.5 million units till date. Completely open-source, Raspberry Pi lets you do most of the basic tasks you'd normally do on a full-fledged desktop. You can browse the web, you can create documents, and you can even play music and watch videos. When it comes to desktop computers, Raspberry Pi is a veritable "Starter's Edition." Since its inception, the project has made common computing available to parts of the world where owning a desktop was once considered a luxury. Moreover, it has also spurred a flurry of interesting projects that take this tiny superboard to a whole new level. 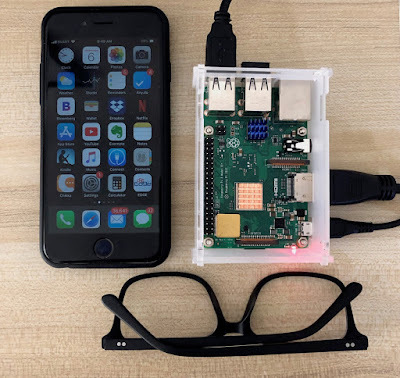 If you are ready to show your creative, geeky side, then read on as we cover some of the best Raspberry Pi projects out there. 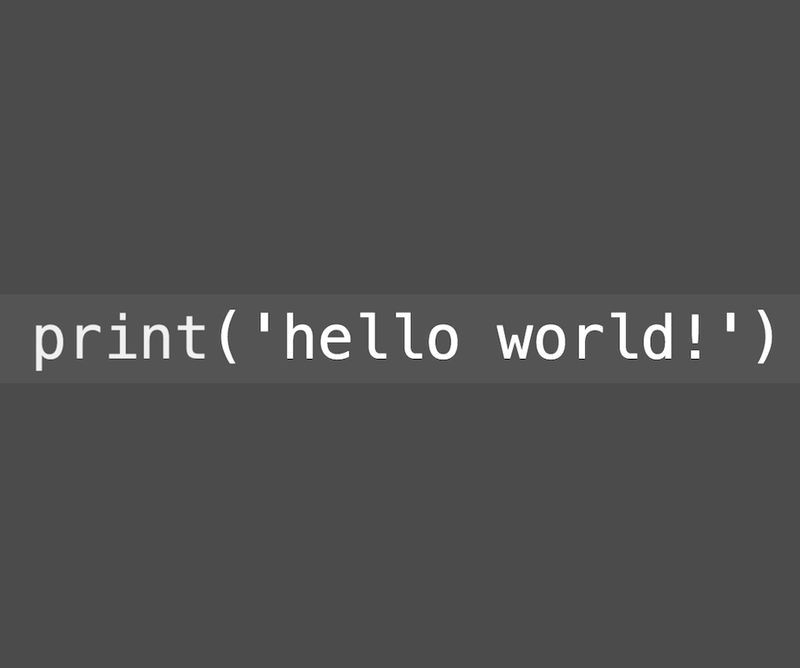 We've already covered a list of the best programming courses out there. However, as good as these courses are, learning programming can be a tough ordeal for kids who need a more hands-on approach to code. 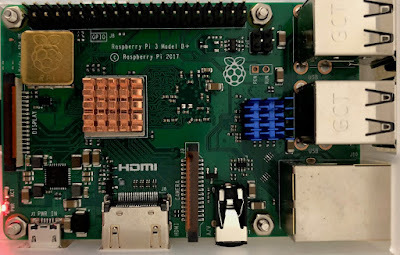 Instead of letting them mess up your production computer, you can buy them a little Raspberry Pi box, hook it up to a monitor, and let them code their heart away. A good programming language that's up to this task is Scratch that turns programming into an activity that's geared towards kids, making the whole process fun and enjoyable to them. In fact, this combination of Pi and Scratch can make programming accessible to places where kids who don't have the privilege of owning a computer, thus making it easy to spread knowledge everywhere. Did you just say media center? Yep, there's a lot this little board can do that you won't usually expect it to do. What's great about Pi is that it supports 1080p out of the box with a tiny-but-powerful GPU running behind the scenes. Combine that with the Xbian project, you got a full-fledged media center on your hands. XBian is a small, fast and lightweight media center distribution that is designed for Raspberry Pi that brings the latest of XBMC to your mini-computer. It's a great, cheap investment if you're someone who likes watching a lot of movies. 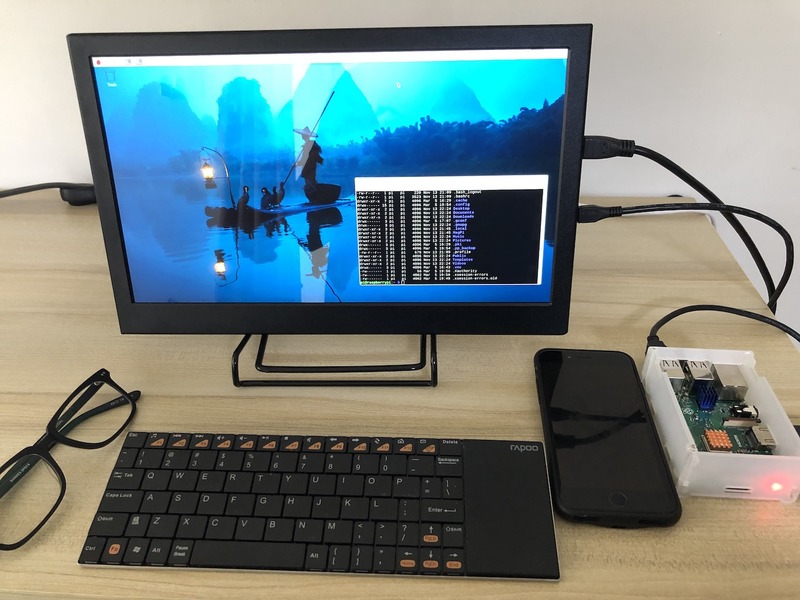 A very interesting blog post by developer Andrei Istodorescu shows you exactly how you can turn Pi into a PC that sits in your car. This means that you'll be able to watch your favorite movies or TV shows in your car. While that's a perfect idea for a romantic date, just make sure that you're not doing Game of Thrones marathons while driving. The blog post explains pretty much everything you need to do in order to install, configure, and get it up and running. The approximate cost of the parts requires comes down to about $200. However, as costly as that sounds, compared to the $25 board, it's a worthy investment for every geek who also loves her car. Envious of your Google Glass-sporting friends? Or maybe you're too privacy conscious to try the search giant's latest wearable. 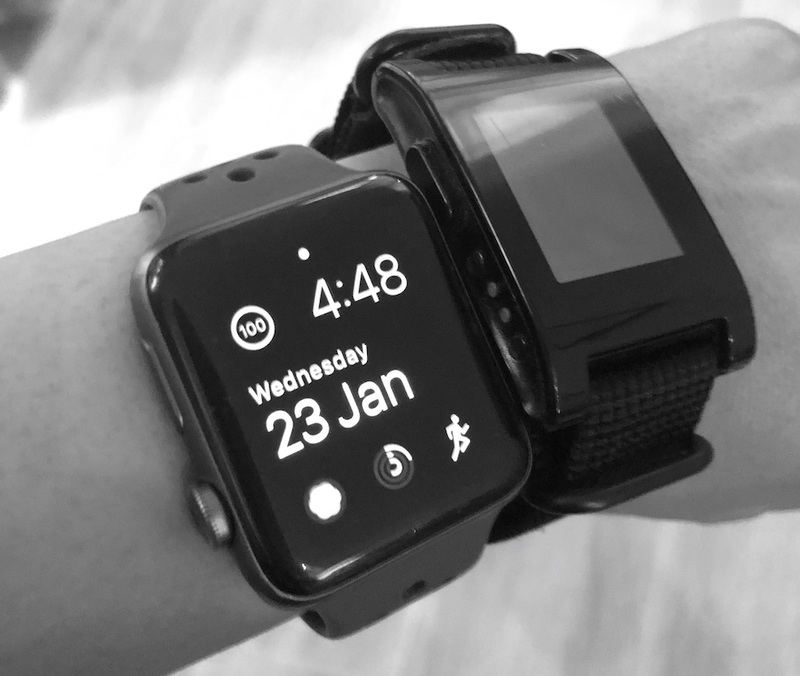 Whatever the case maybe, geeks and privacy enthusiasts can make use of Pi to create a DIY wearable that they can brag about to their friends who are busy drooling over Android Wear, Google Glass, and other wearables. While no way near perfect, this project can provide a full-powered desktop computer that you can use wherever you are. Even while walking. Although the cost of this project is about $400, it's a justified investment for every geek out there who wants to have a great learning experience. Instructables has another cool guide on turning your Pi computer into a universal remote. Though you'll need some parts to get that working for you, those little investments are worth it if you're a lazy geek who loves to control everything from the couch. Also, it's a great learning experience for anyone who's interested in knowing more about the LIRC or tinkering with electronics. A bit tough to get working overnight, this project can be treated as a huge learning experience more than just a way to create a universal remote. You can also pair this off with XBMC and then create an ultimate media center with remote and everything at a very low cost.